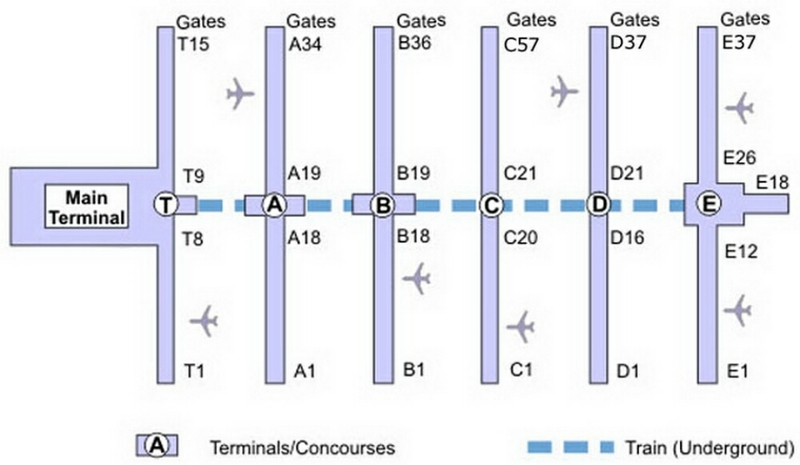 Below is the Hartsfield-Jackson Atlanta International Airport (ATL) terminal map. We hope this map makes your travel experience just a little bit easier. Please verify all information before making travel reservations as Atlanta Airport terminal information may have changed. Atlanta International Airport is the worlds busiest passenger airport with the worlds largest terminal complex spread out over one international and six domestic concourses. The airports underground train keeps the passengers moving between the concourses and the terminals. If you decide to walk instead of taking the train you are in for a long walk. We recommend arriving at the airport more than two hours before your flight time on busy travel days to accommodate likely security delays. These issues and the airports overall out-dated appearance will change by a $5.4 billion, 10-year development program that will modernize and expand airport facilities.